Are Scotch Bonnets hotter than Jalapeno peppers? Is there a scientific way to measure spiciness? Where are chillies originally from and can they grow in any climate? What is the best way to put out the fire when a chilli turns out to be hotter than expected? Gardening website Lovethegarden.com are launching the infographic “Hotter than the sun” today to answer these and many other questions about chillies. The chilli is a vastly popular ingredient worldwide. There are a multitude of different varieties with unique flavours and heat levels. 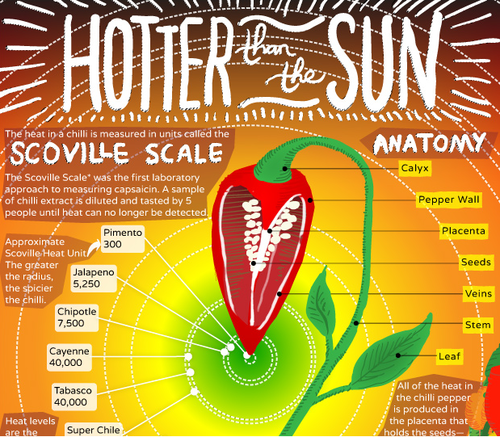 The infographic “Hotter than the sun” explains that the heat is caused by an oily substance called capsaicin, which consists of capsaicinoids. Scientists have identified 15 different capsaicinoids, so there are endless varieties of capsaicin.